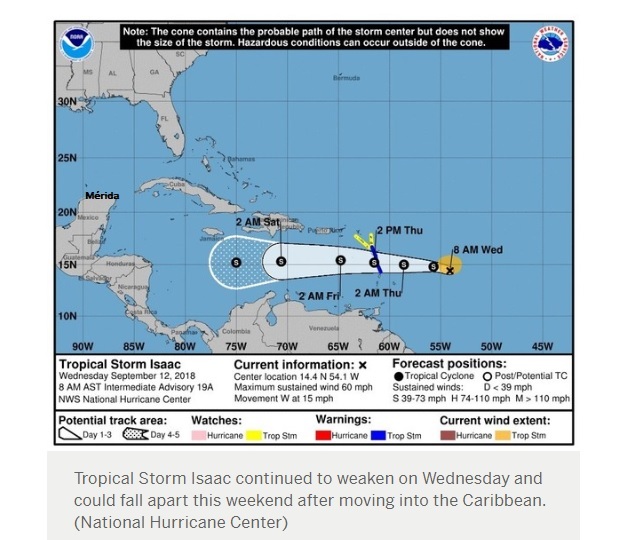 Tropical Storm Isaac appeared “poorly organized” and was weaker on the early morning hours of Wednesday Sep. 12 is it moved closer to the Caribbean. As of 10 a.m. CDT Tropical Storm Isaac was located about 420 miles east of Martinique and was moving west at 17 mph, according to the National Hurricane Center. On that path Isaac will move across the central Lesser Antilles and into the Caribbean on Thursday. Isaac had winds of 60 mph, and the hurricane center said gradual weakening is anticipated over the next few days. Wind shear continues to take a toll on the storm, and computer models think that shear will stay on the moderate to strong side for the next few days. “In a couple of days, while the wind shear could decrease over the east-central Caribbean Sea, there might not be much of a system left to take advantage of the more conducive conditions,” the hurricane center said in its forecast discussion on Wednesday morning. Some of the models show Isaac degenerating into a trough of low pressure in five days.